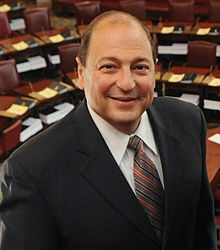 New York State Senator Thomas W. Libous, the second highest ranking state senator, was found guilty Wednesday of false statements to the FBI. The conviction came after a seven-day federal trial in White Plains. Authorities charged that Libous, 62, had obtained a job for a family member at a Westchester law firm in exchange for a promise to refer business to the firm, and had arranged for an Albany lobbying firm that regularly lobbied him to secretly pay the law firm $50,000 per year to defray the cost of the family member’s salary and lease of a Range Rover. The lobbying firm specialized in transportation issues and Libous served as the Chairman of the Senate’s Transportation Committee at the time. Libous then lied to FBI agents investigating the matter. Posted: 7/23/15 at 12:08 PM under News Story.